One of the pleasures of wet-marketing in Sumatra is pausing for a pick-me-up at a pondok kopi (lit. 'coffee hut'). Fixtures of big-city daily markets and laid-back village weeklies alike, pondok kopi are nothing more than lean-tos furnished with a well-worn wooden table and a bench or two, and equipped with a single gas burner for boiling water and heating an oil-filled wok. Whether scattered around a market's periphery or stuck right in the middle of the action, pondok kopi offer a soothingly cool and quiet respite from the marvelous sensory overload that is the Sumatran food market. On this morning we've been wandering the crowded aisles of a weekly market in a village just 15 kilometers (but an hour's drive over wild, forested hills and through a rice-paddied valley dotted with traditional Minang houses) from Bukittingi. 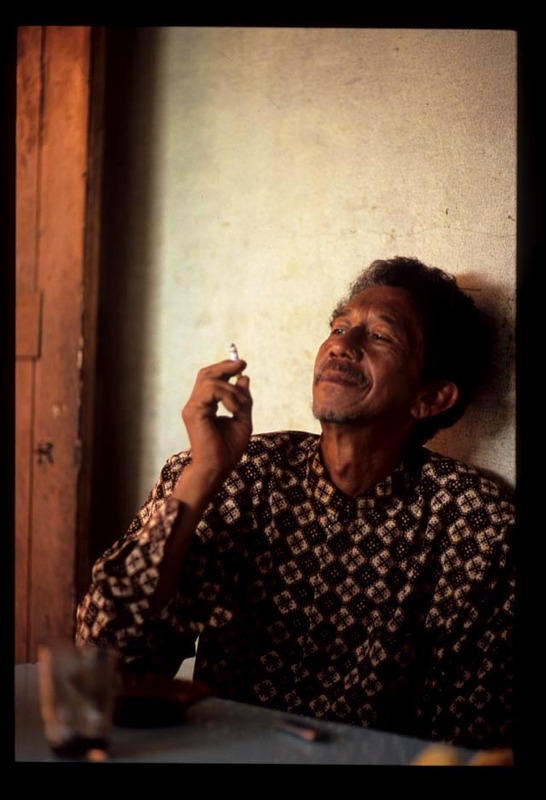 Sitting with our backs against the wall of this tiny structure-within-a structure, we can watch both the proprietress at work and, through the pondok's picture window, the goings-on at the mango seller's stall just across the aisle. Our fellow customers are, as usual, men - sellers at the market stealing a moment from their work. 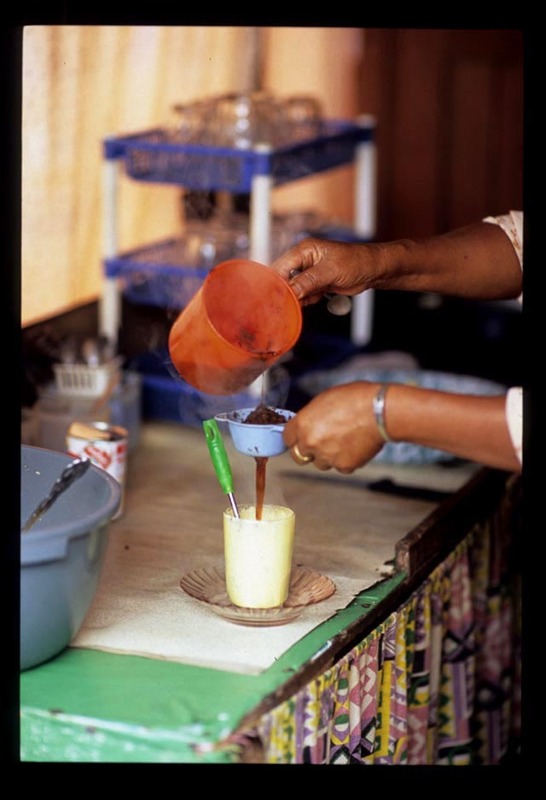 In Sumatra, women don't frequent pondok kopi (though I'm never made to feel less than welcome); at the market, female vendors have refreshments delivered right to their stalls. 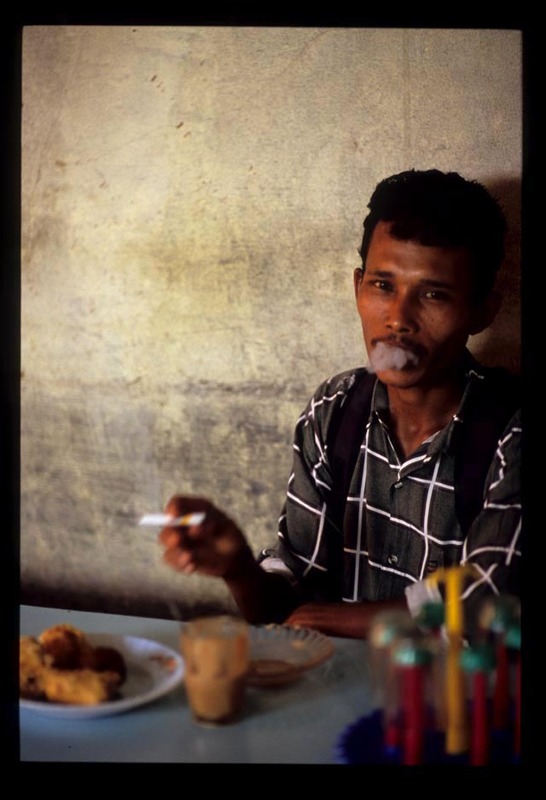 Our usual beverage of choice is kopi susu - rich, unfiltered Sumatran coffee with sugar and sweetened condensed milk - but the men sitting against the wall kitty-corner convince us to try a Sumatran specialty: teh telur, or tea with egg. 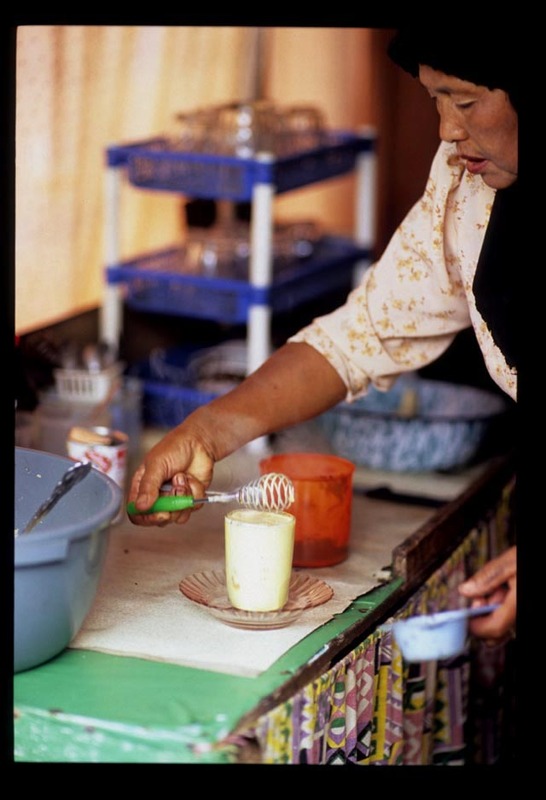 The pondok's proprietress cracks an egg into a glass, adds two heaping spoonfuls of sugar, and sets to work with a whisk. Applying an admirable amount of elbow grease, she creams egg and sugar to a thick, pale yellow froth that would be the envy of any professional baker. 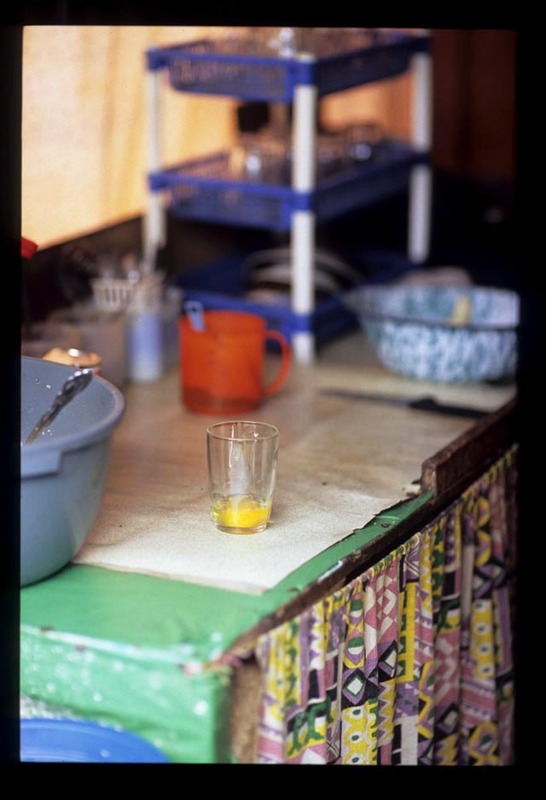 In a separate cup she steeps Sumatran tea leaves in boiled water poured from a thermos, and then strains the tea into the creamed egg-coated glass. A bit more whisking mixes tea with egg and creates a foamy, cafe latte-like head. 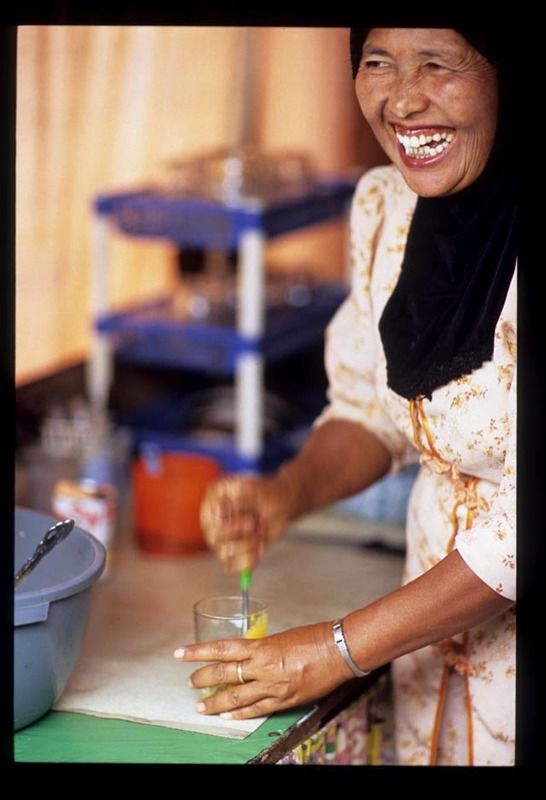 For a Sumatran, a caffeinated beverage can never be too sweet, so she finishes our sugared teh with a generous pour of sweetened condensed milk. Following the lead of our fellow teh telor sippers, we splash about half the glass into its accompanying saucer - to cool it down and, we guess, allow for sugar-and-egg moustache-free enjoyment. Its delicious, rich sweetness is balanced by the red tea's bitterness. This teh telur's creamy eggy-ness brings to mind melted ice cream or custard that hasn't set properly, and leaves us keen to sample its cousin, kopi telur. 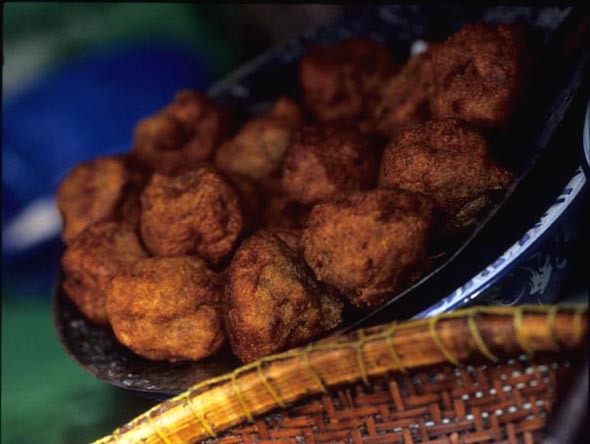 Between sips of teh we gobble down godok pisang, luscious deep-fried banana fritters, as they emerge from the wok. Like other southeast Asian treats incorporating several varieties of intensely flavored stubby bananas, they're amazingly fruity, almost artificially so. With a crackly outside unmarred by excessive grease enclosing a chewy and moist banana bread-like center, these morsels have become our Sumatran a.m. addiction. Re-fueled and wondering what culinary surprises the rest of the market has in store, we pay up - by the glass and by the fritter - and dive back in, leaving our caffeine-break company to enjoy their own post-teh refreshments. Robyn - You know I have a weakness for the coffee (or tea) post. Fascinating stuff. I can't get over the sugar AND condensed milk. Great post! And, I'm with Shiewie on the photos. Congrats to your other half! You know Sticky, halfway into writing this post I did think to myself, "Sticky will like this one." Yeah, the sugar AND sweet milk can get a little over the top. your photos are extraordinary and beautiful. i really enjoyed this post. hkho - thank you for yr comment - and compliment! 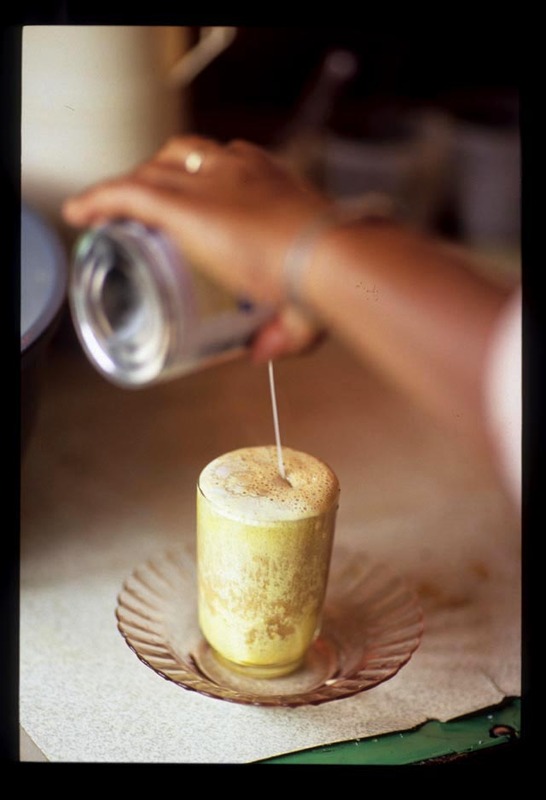 i recently had my first vietnamese egg soda (egg yolk, condensed milk, and cream soda) and loved it. sounds like i should try this too! Beautiful, for your photo and writeng here. How fascinating putting an egg in tea! Yes, in Asia, they add condensed milk too. Love your posts and Dave's photos.